All-In 2Night is a family routine. For one night of the week everyone stays home. By spending ten to twenty minutes together, you can learn and talk about the things that matter. Following on from Lynne’s original book this set of new activities is designed especially with Christian families in mind. The book includes 40 weeks of activities, designed as 1 per week of the school year. Activities include love languages, listening for God, self-esteem, the fruits of the spirit and many more. These family activities provide an opportunity to grow values, goals, hopes, feelings and the foundation for a Christ led life. in the past year, i've realized more than ever how important spending time with family is. losing my grandma coupled with the reality that my son will be leaving for college in less than 2 years has made family time so super important to me. i think life gets so busy, and the world moves so fast, our family seems to get lost in the shuffle. and when time is spent together, everyone has their nose immersed in technology. genuine family time seems to be a thing of the past. but it doesn't have to be. 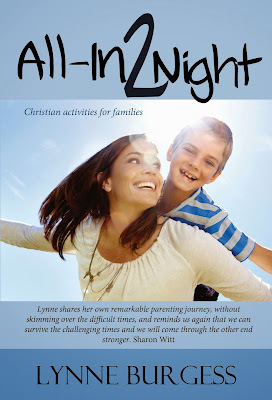 that is where author Lynne Burgess got the idea to incorporate what she calls family nights back into her home and she has shared her secrets in her latest book called All-In2Night. the book has 40 topics that can be related to by every family. Lynne shares how to instill God values in your children, activities you can work on with your kids and some super great conversation starters. this book is definitely one i would recommend to all parents. this is such an excellent resource that i wish i had when my kids were smaller.